At first sight, the subjects of piety and family life may appear to have little in common. Yet, as the essays in this volume make clear, there are in fact a number of shared features and points of contact that make the study of these issues a particularly fertile area for scholars of the Reformation period. 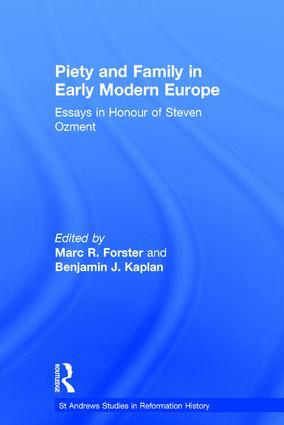 Whether it be the concept of an individual's relationship with God - so often articulated in familial terms, the place of domestic devotions, or the difficulties that faced families split by rival confessional beliefs and mixed marriages, this book demonstrates how piety and family life were interwoven in the social and theological landscape of early modern Europe. Inspired by the works of Steven Ozment, the volume is divided into two sections, each of which deals with a particular concern of his writings. The first four chapters address issues of Reformation theology and the medieval heritage, whilst the remaining seven examine the spiritual life of families. Together they underline how modern scholarship by broadening its conceptual outlook and bringing together seemingly unrelated subjects, can provide a more sophisticated understanding of the past. Contents: Introduction. Part I Reformation Theology and The Medieval Heritage: Tauler the Mystic's Lutheran admirers, Eric Lund; Luther, spiritualism and the spirit, R. Emmet McLaughlin; Anxious penitents and the appeal of the Reformation: Ozment and the historiography of confession, Ronald K. Rittgers; 'Bite this, Satan!' the devil in Luther's Table Talk, Carlos M.N. Eire. Part II The Spiritual Life of Families: Domestic devotions and family piety in German Catholicism, Marc R. Forster; 'For they will turn away thy sons': the practice and perils of mixed marriage in the Dutch Golden Age, Benjamin J. Kaplan; The household divided against itself: Anabaptists and their families in Tyrol, 1536-60, D. Jonathan Grieser; Negotiating conversions: catechumens and the family in Early Modern Italy, Lance Gabriel Lazar; Holy Mothers: the history of a designation of spiritual status, Laura A. Smoller; Sorrow and worship in Calvin's Geneva: their place in family history, David Keck; Seduction and the law: a Jewish scandal before the Imperial Chamber Court, R. Po-chia Hsia; Index. Marc R. Forster is Professor of History at Connecticut College, USA. Benjamin J. Kaplan is Professor of Dutch History at University College London, UK.